Have Hunting Land for Sale in Ohio? Tips to Boost Your ROI! Buying commercial real estate is one thing – it requires maintenance and upkeep. Buying hunting land for sale in Ohio, however, is an entirely different situation. Not only does it require maintenance and upkeep for human standards, but if the buyer wants to use it for its intended purpose (you know, hunting) then it needs to be both prepared and maintained for deer. If you want deer (or any other animal, really) to call your place home, then you need to provide them with the necessities: food, cover, and water. The good news is that these three things are well within your control. Add fertilizer to your property. Approximately 10% of your property should consist of openings – this helps with the growth of plants and vegetation. Carefully use controlled burns to diversify the vegetation on your property. Consider disturbing the soil through tillage to stimulate the growth of grass. Next, work on improving the cover on your hunting land for sale. This makes deer feel safe and secure. Believe it or not, many of the same strategies you are using to improve vegetation can also help; deer will often use plots containing corn and other vegetation for cover. Finally, make sure you have plenty of water available – you can do this with a creek, pond, tank, or watering hole. Deer can sense hunting pressure. For this reason, you may want to consider limiting the number of people hunting at once. Create and put up signs to take that responsibility off the shoulders of the buyer purchasing your land. Establish at least one safety zone on your hunting land with thick cover where deer can feel safe. Make it clear that it’s off-limits to hunting, scouting, and even hiking so the land buyer can take advantage of your warnings. This will be a good place for deer to feel secure and keep them feeling like the property is a place they can be…even long after the land is sold. Always be sure to collect data on the deer residing on your property (if you currently have any deer on-site). This can include the number of deer, their age, and other data to help you to keep track of their routines. 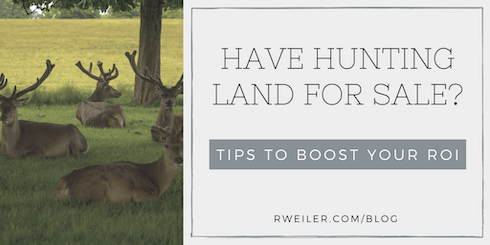 This is valuable data that you can provide to the person who decides to buy hunting land from you. If you have a hunting property for sale in Ohio, there’s a great resource available. Visit wildlife.ohiodnr.com to find a wealth of resources from the Ohio Department of Natural Resources (ODNR) Division of Wildlife. There you will find helpful information on regulations, allowable equipment, tick prevention tips (which may come in handy while you’re preparing your land), and much more. Need Help Listing Your Hunting Land for Sale in Ohio? In Ohio, hunting land is a commodity. At The Robert Weiler Company, we have been Ohio’s trusted commercial real estate experts since 1938. Give our land brokers a call at 614-221-4286; let’s discuss how we can help you with your hunting land for sale in Ohio.